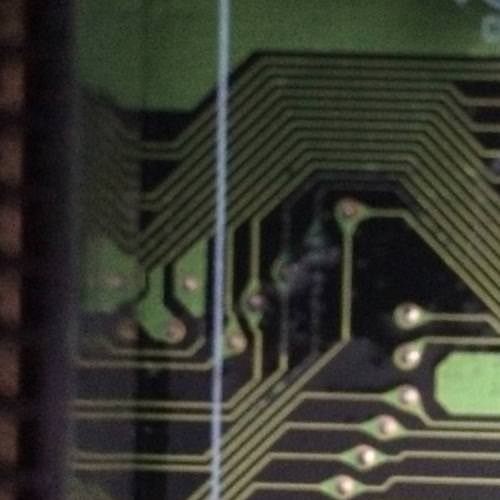 Leaded Solder | Old computer repair, history and programming. Some more mini updates for things that weren’t big enough to merit a full update on their own. 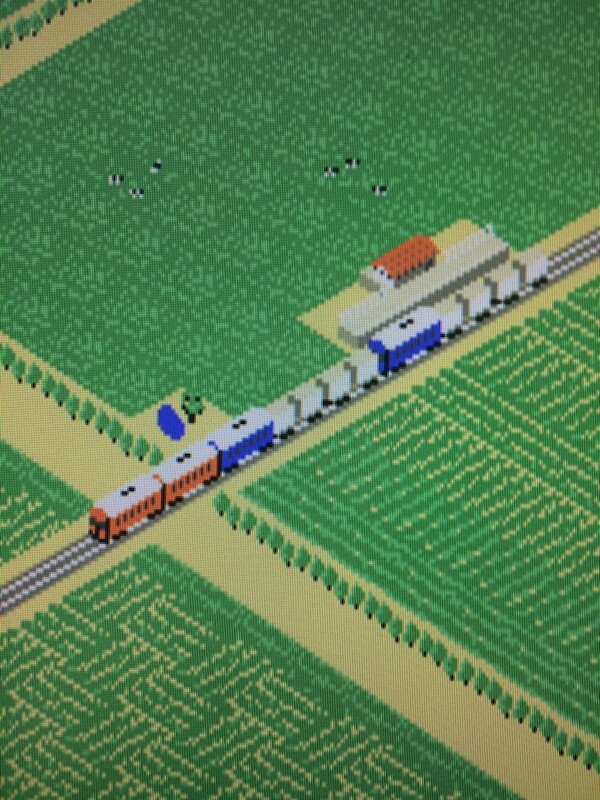 In this entry, we’ll finally get A-Train III running on my PC98, fix an Atari ST keyboard, and ship new hardware for a whole new brand of Japanese 8-bit computer. When I first got the HB-101, its combination of small RAM and lack of any way to get software on it was a problem, sure. 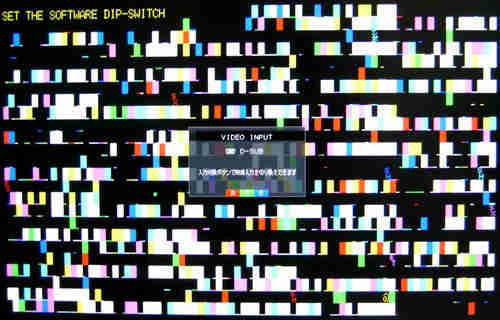 There was a bigger problem waiting, though: the grim spectre of an inconsistent keyboard. 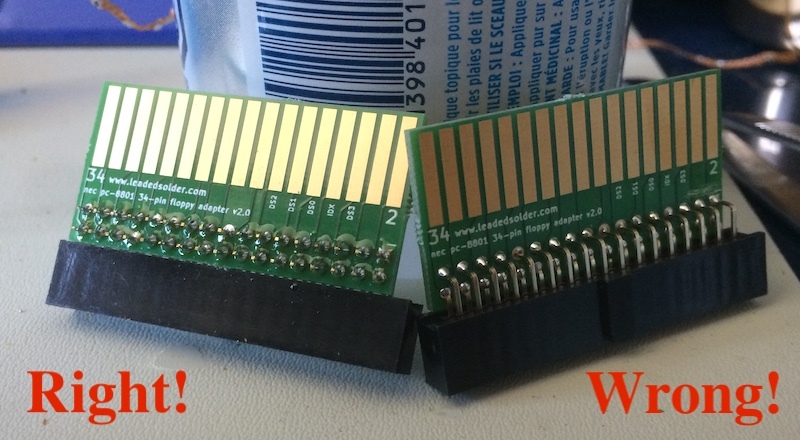 In my previous entry, I found out that my old IBM PC “DOS” floppy adapter was not sufficient when trying to read from two drives at once. 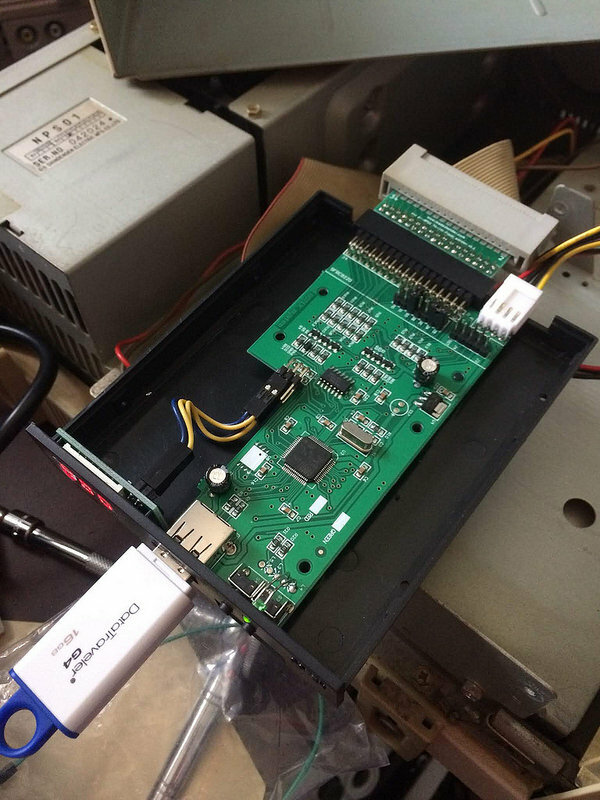 Somehow, they confused the floppy controller enough that nothing could be read from the second drive. 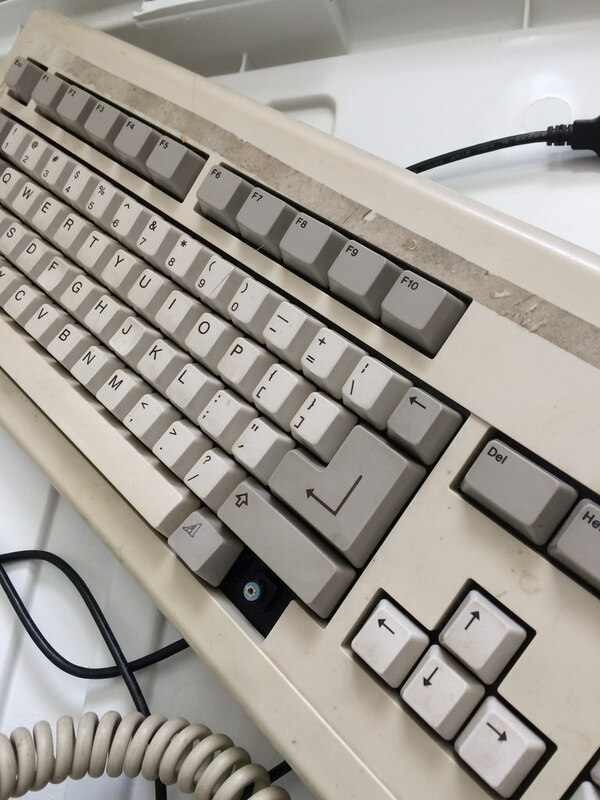 A few years ago, my friend Grant completed a refresh of one of his Model M keyboards (I know, right?) Here’s his writeup on the process. 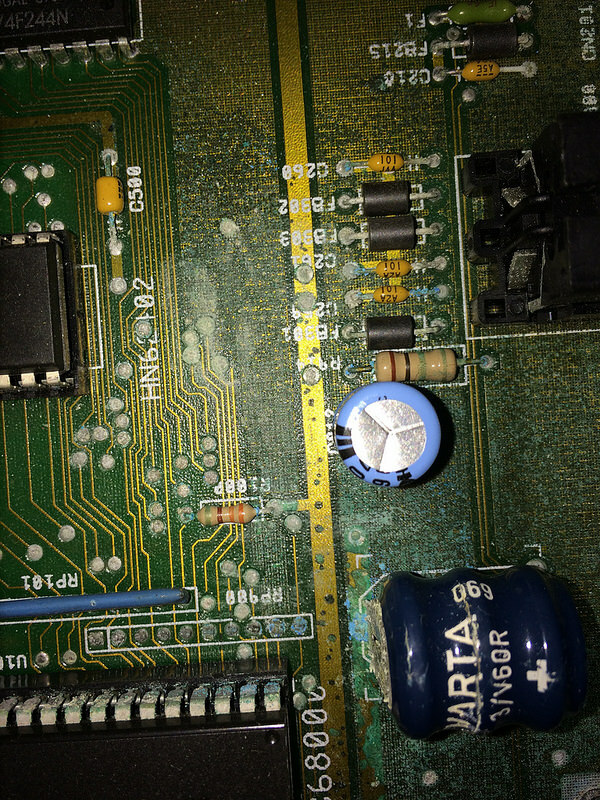 I popped open my “good” Atari ST today. 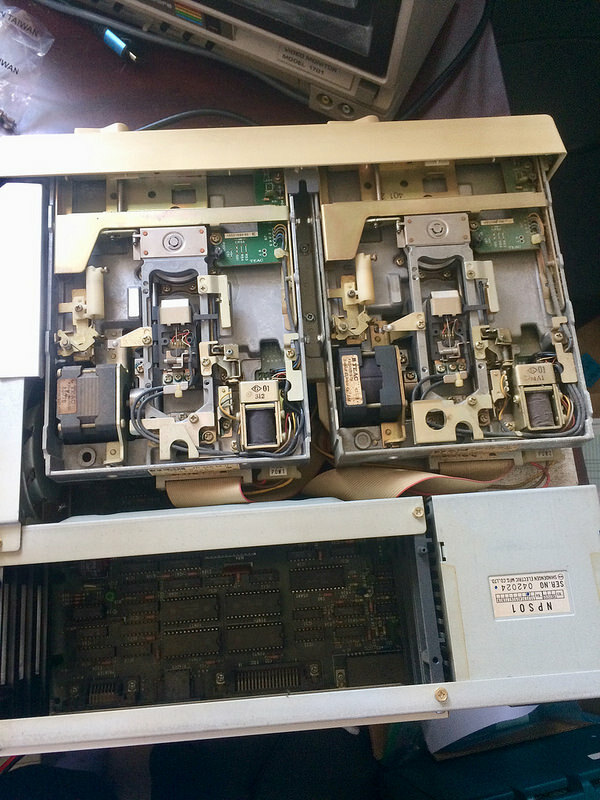 As you might remember, I have two 1040STFs: a very battered one I got from a flea market, and a nice-condition one that was owned by a guy who really cared about it, but had passed away. The only thing that was really wrong with this machine is that the mouse didn’t work. 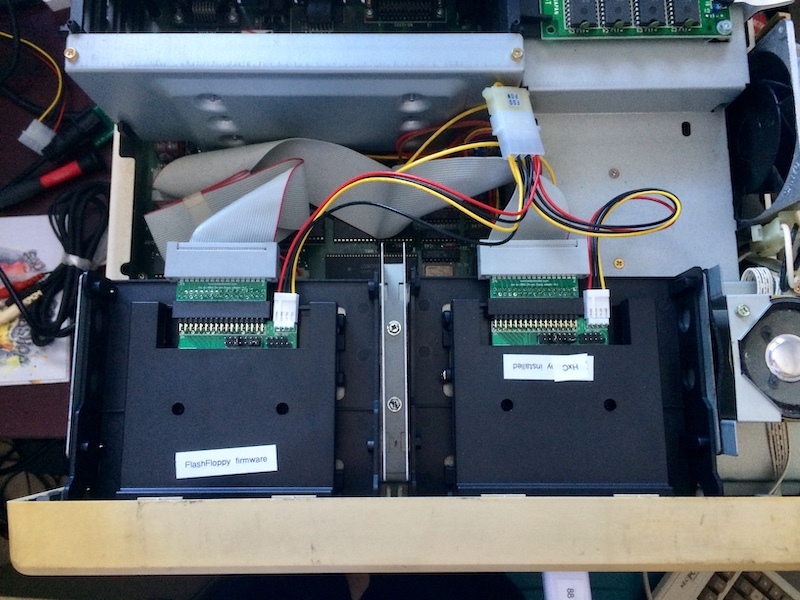 I got another couple of Gotek floppy emulators from China, and now the SR has dual floppy drives. Unfortunately, I can’t use them both at the same time. Japanese Santa dropped by my house earlier this week and left behind a back-shredding 40lb box of microcomputer goodness. Let’s investigate. 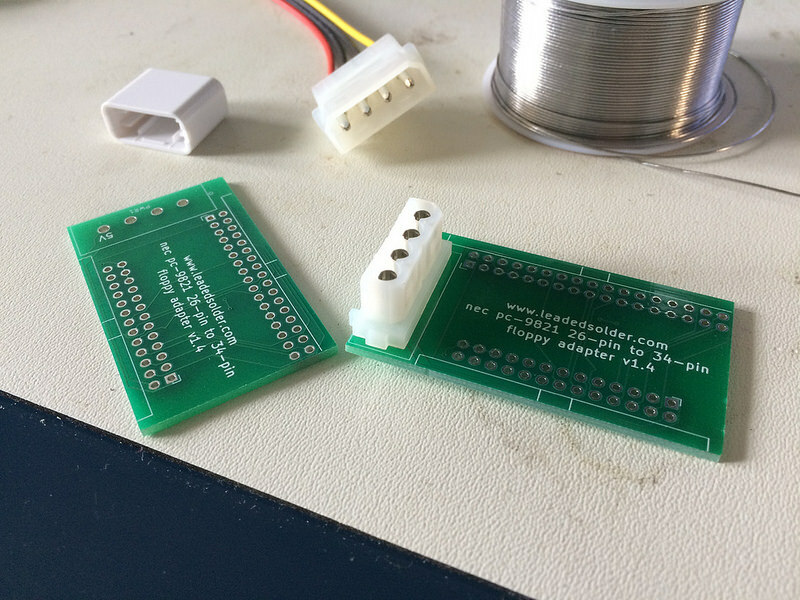 I’ve been up to a bunch of little projects while waiting on parts and time for the big jobs, so here is another mini-update on three of those projects. 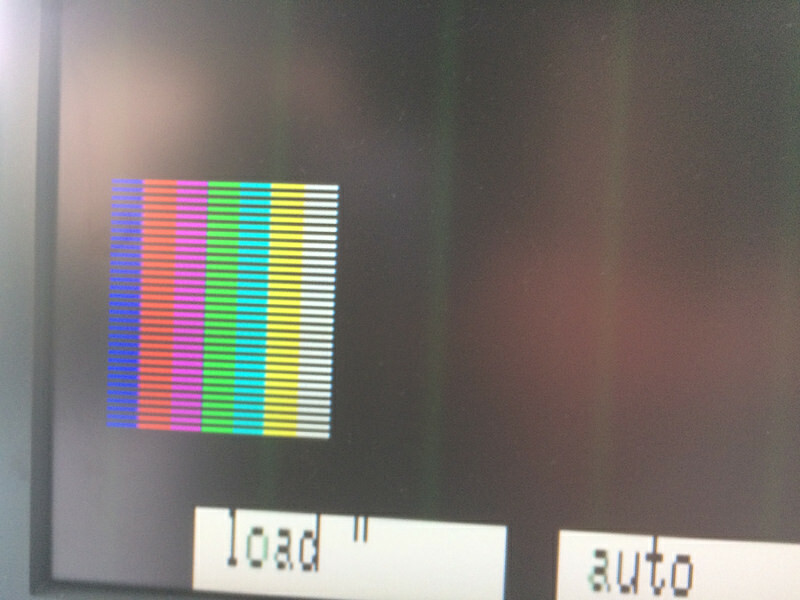 After a respin of the PC88 colour video board, the PC8801mkII now has excellent digital colour video out. 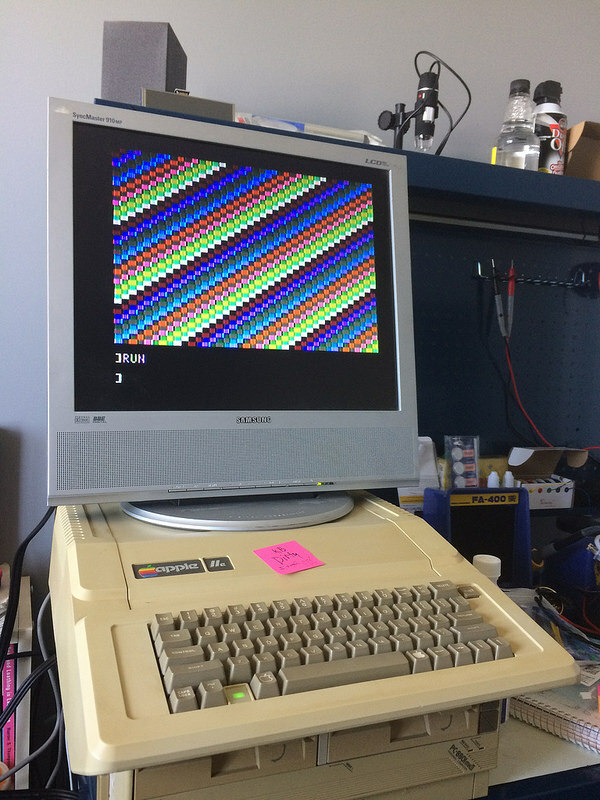 I’ve had my Apple IIe for a few months now, and it’s been great. 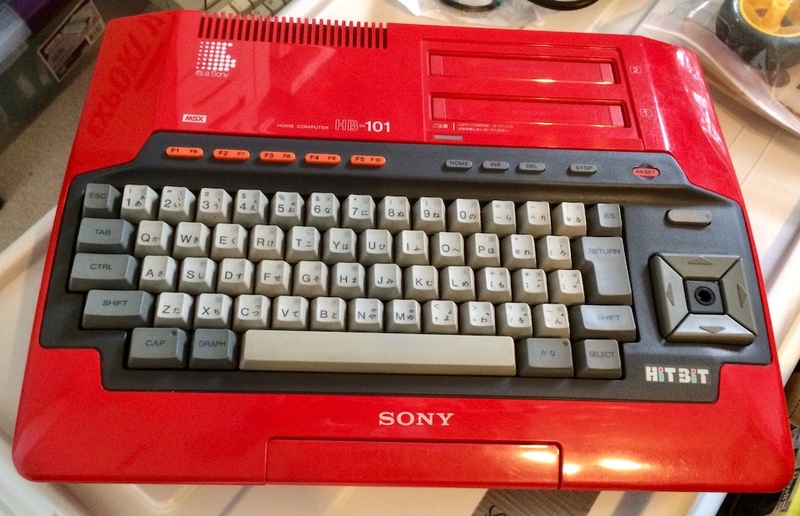 One of the things that’s kept it from getting more use has been the spotty “I” key, which the seller warned me about. Just as I was beginning to lose hope that the hard drive I had ordered back in August from Yahoo Auctions Japan would ever arrive, my doorbell rang. 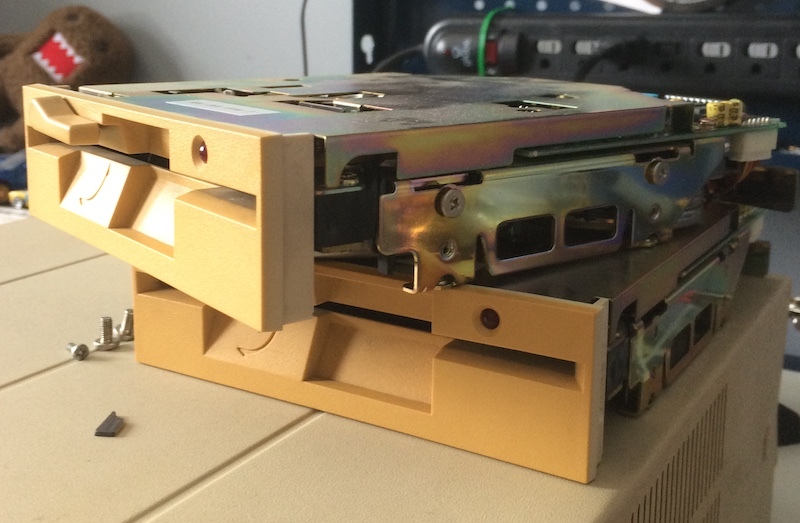 Inside a beat-up but functional Suruga-ya box sat the hard drive, done with its international journey. Now that the PC98 can load software off of a USB stick instead of floppies, I decided to explore the software catalogue a bit. 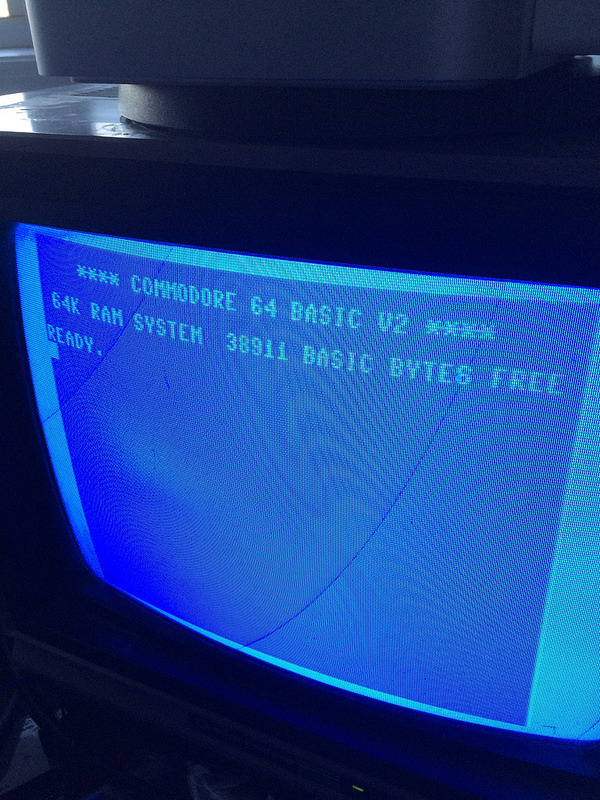 I’ve been using the monochrome video cable on my PC88 ever since I built it. 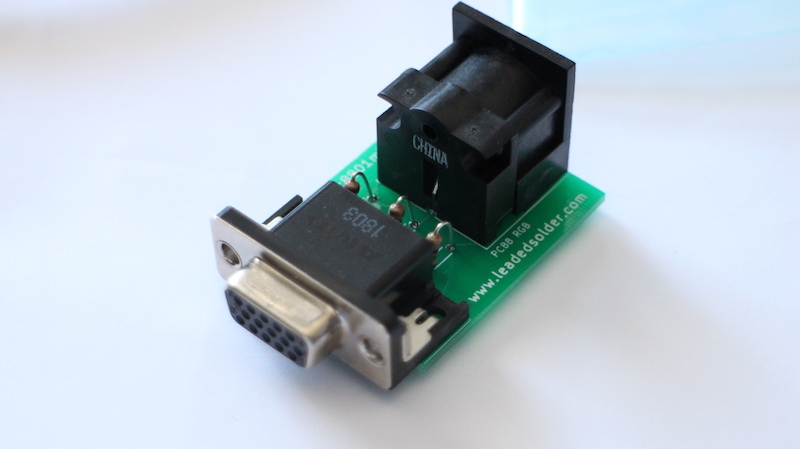 Colour video was a little more complicated, so I ended up designing a bunch of adapters to try and get it to work. I’m happy to announce that one of those adapters has finally worked! 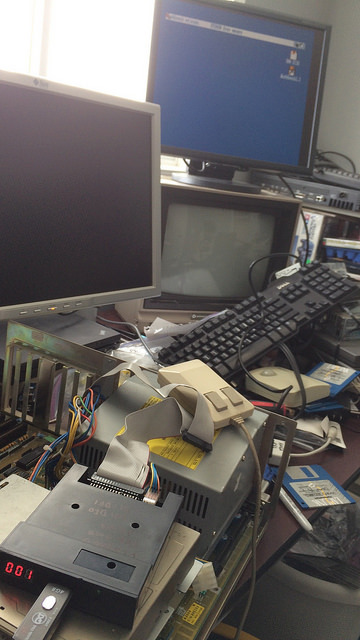 Now that the PC98 can load a game off a flash drive, there’s a lot more parts of it I can test. 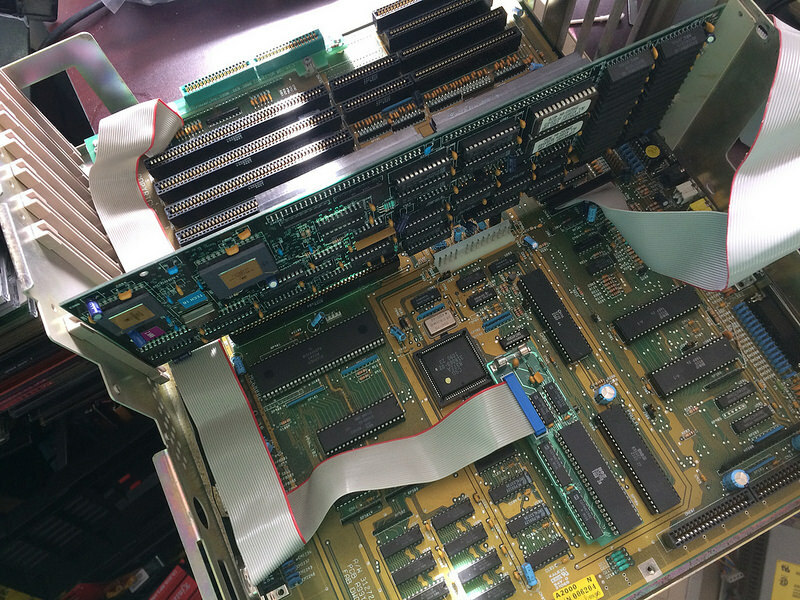 Today, I spent a few minutes putting together a new revision of the floppy board and inspecting the computer. 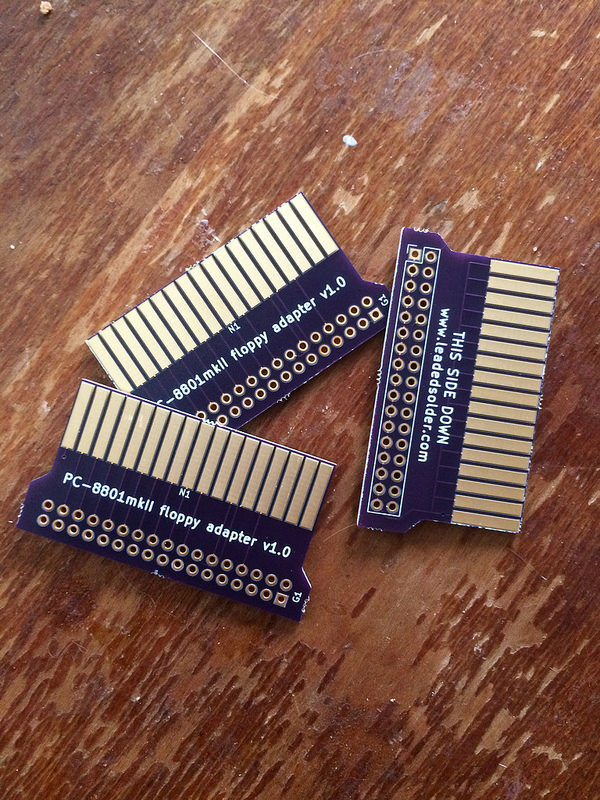 Floppy adapter board works for the PC98! After I designed the first version of my PC88 floppy board, I thought it would be fun to put one together for the PC98 as well. 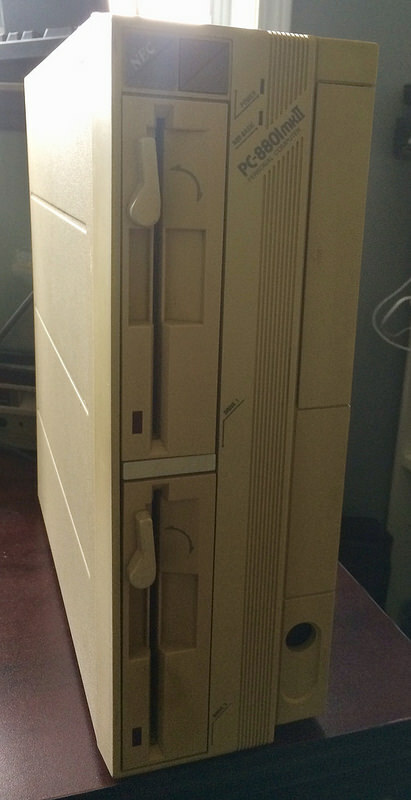 Why do I need an adapter for a computer that already has 3.5” floppy drives? 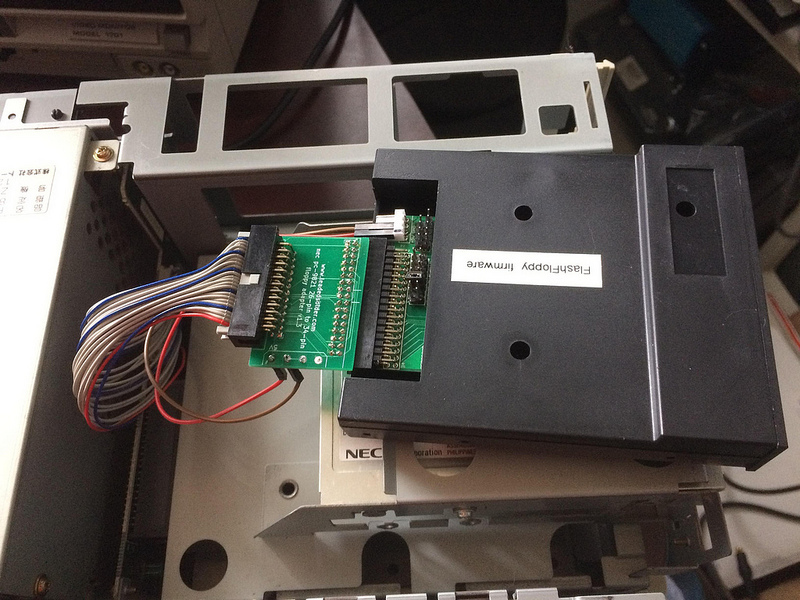 The PC9821AP2 I own has a 26-pin floppy drive connector, like a mid-90s laptop, and most standard IBM PC style floppy drives have 34. In the last entry, I found myself with a working adapter board to allow a 3.5” floppy drive (like a Gotek) to work with the NEC PC8801mkII. 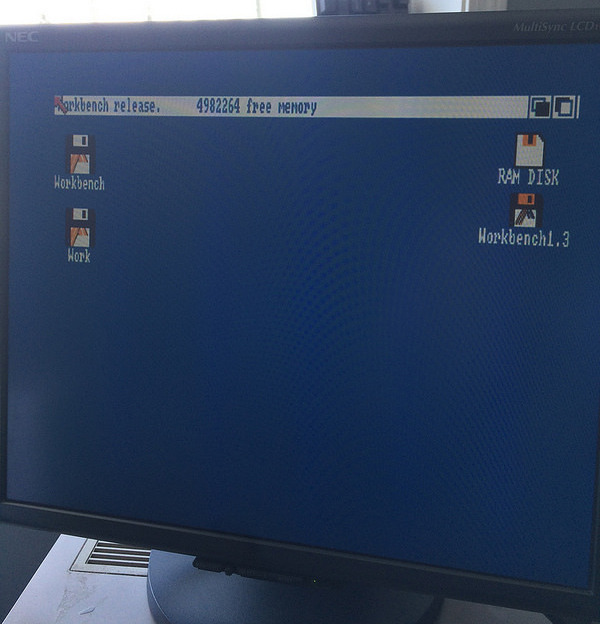 This liberated me from having to source, organize and maintain 5.25” floppy disks, and opens a large library of software for this computer without having to hunt through the used market. However, like all good things, there were a lot of bugs with the old adapter. 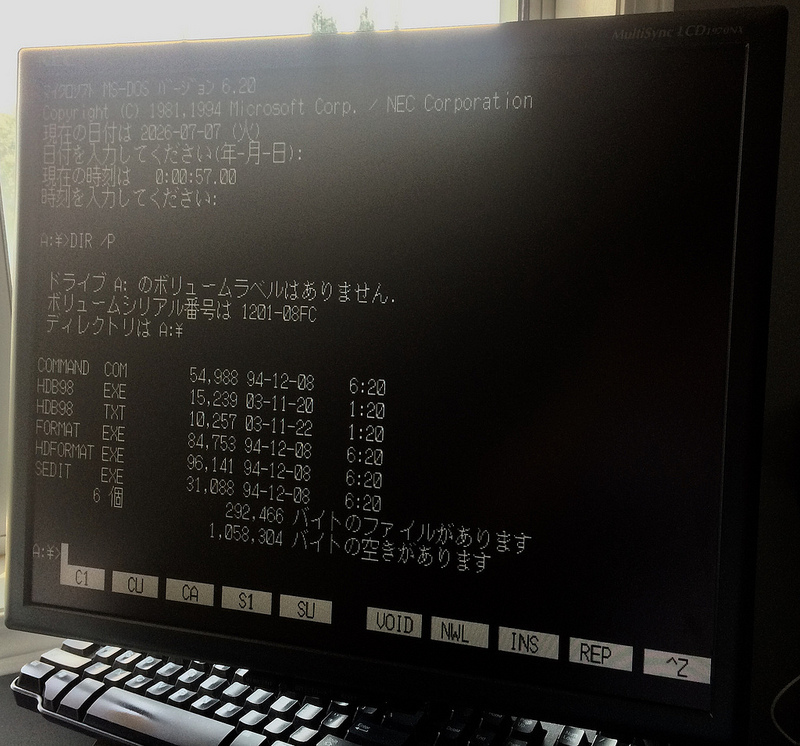 I wanted to get a Gotek working on my PC88, and after seeing that there were a lot of Japanese hobbyists who had managed to get an HxC floppy emulator working, decided it must be possible - even if not simple. 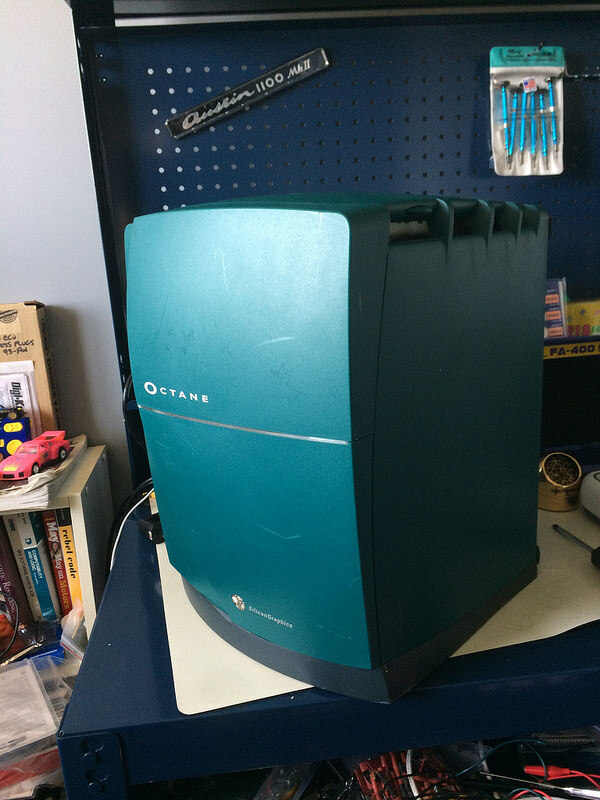 Many years ago, I grabbed an SGI Octane off eBay from a junk dealer. They didn’t pack it well, so the machine arrived beat up and stuffed full of styrofoam fragments from the packing material it had shredded on the way. After a few attempts to lug the machine around in the small condo I had at the time, I gave up and just let it slowly be re-absorbed into the pile of non-working computers. 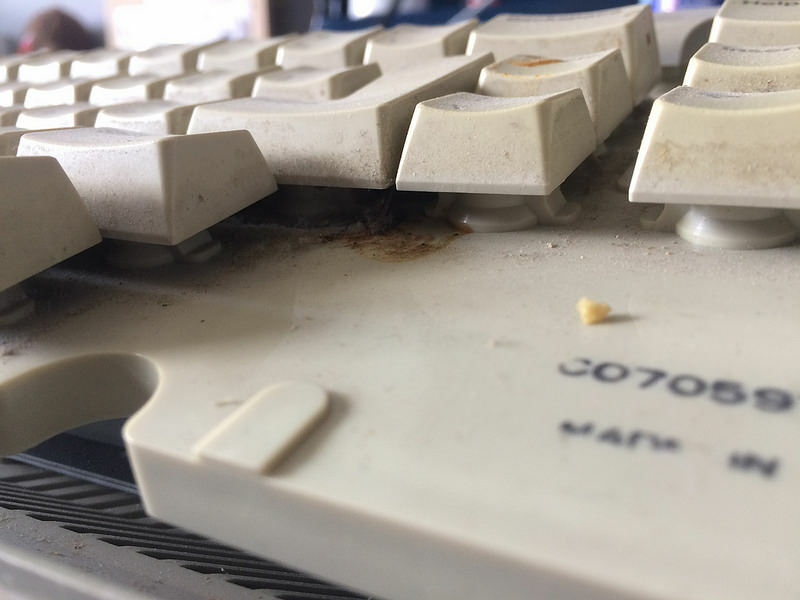 I delved into the depths of my trusty Showa-era NEC to remove its leaking (leaked?) battery. Here’s what I found. Going to try a new format for this entry; there are some small updates to keep a record of, but nothing deserving of a full entry on their own. In the last entry, we left our intrepid hero with no video out. After a quick consultation of the Japanese internet, and a not-so-quick cable soldering job later, we now have black and white video and can use N88 BASIC (at least in theory). 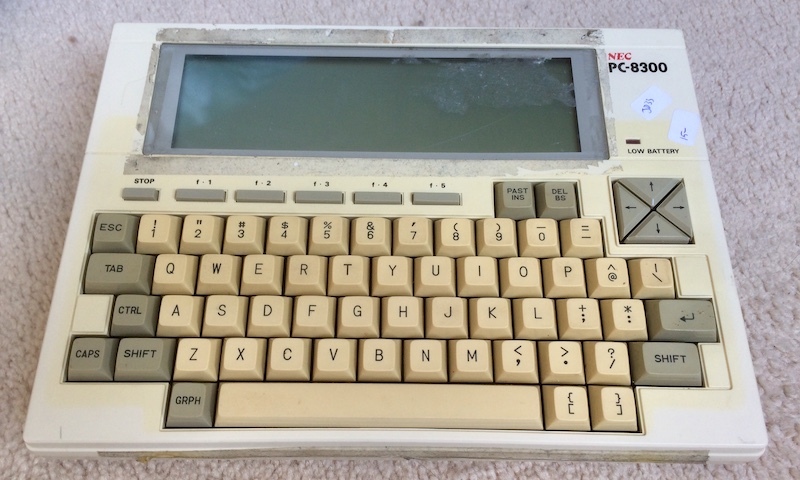 While the PC9821 has horsepower and 90s clone styling for days, the real reason I spent all this effort and money was to get personal with the PC8801 platform. 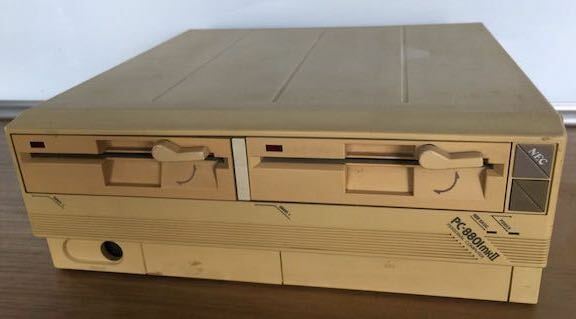 This humble little NEC home computer platform launched an indie game development revolution - well, or at least it did after this one was made. In fact, this 8801mkII, having been released immediately before the gaming-friendly 8801mkIISR, is only really useful to someone super weird who wants to learn about its guts on the cheap. I don’t know anyone like that around here, so I might as well do it. You’re welcome, future historians. 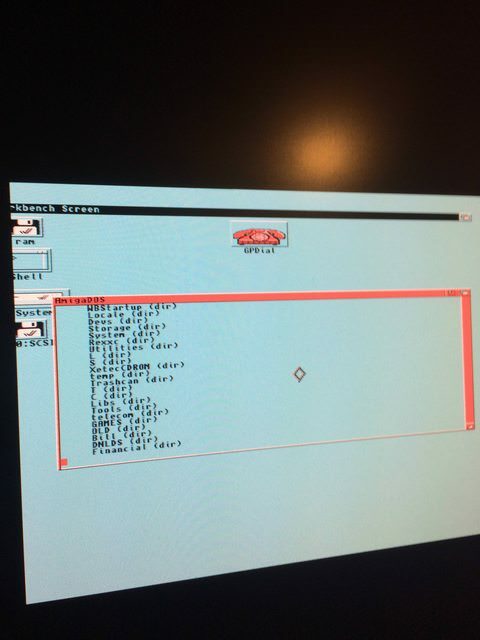 I only had a short amount of time to play with the computer today, but thanks to a very knowledgable friend, I got a known-good DOS 6.2 image with some disk utilities written to a floppy and booted. 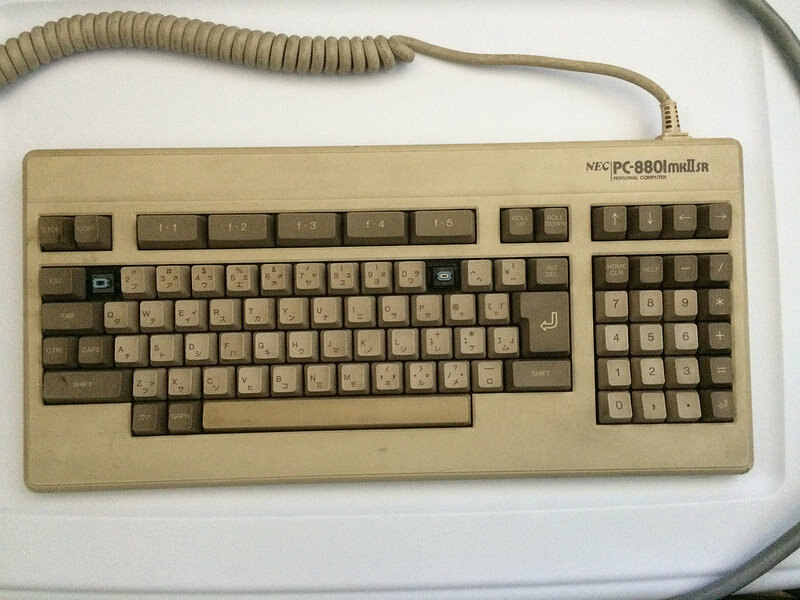 Months ago, I won a PC8801mkII and a PC9821AP2/U8W off Yahoo Auctions. They arrived, but life got busy, and so the blog hasn’t been updated in quite some time. What better way to bring it back than a deep-dive into a computer whose language I literally do not speak or understand in even the slightest way? 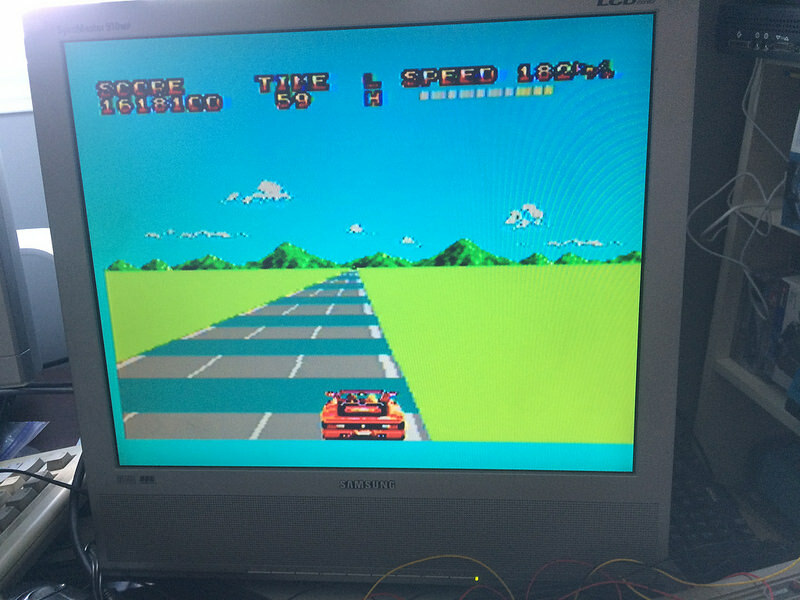 Fresh off the success of the trace-repaired Genesis, I decided that I was an electronics god and could fix anything. That’s why I ordered this untested Mac SE from a place in Texas, where it was listed as being good to make a movie prop out of. 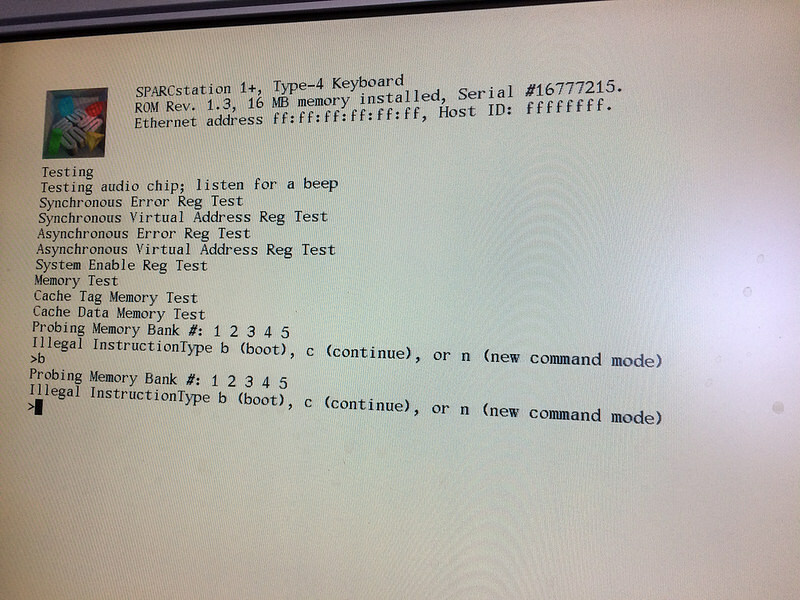 The SparcStation 1+ is still pulling its weird “Illegal Instruction” error, but at least now we know the keyboard works. The slow accumulation of an entire collection of vintage Sun hardware continues, with the 1+ now being able to show video. The question is, what else will it take to boot? The Mac TV is a machine that I’ve had for awhile. 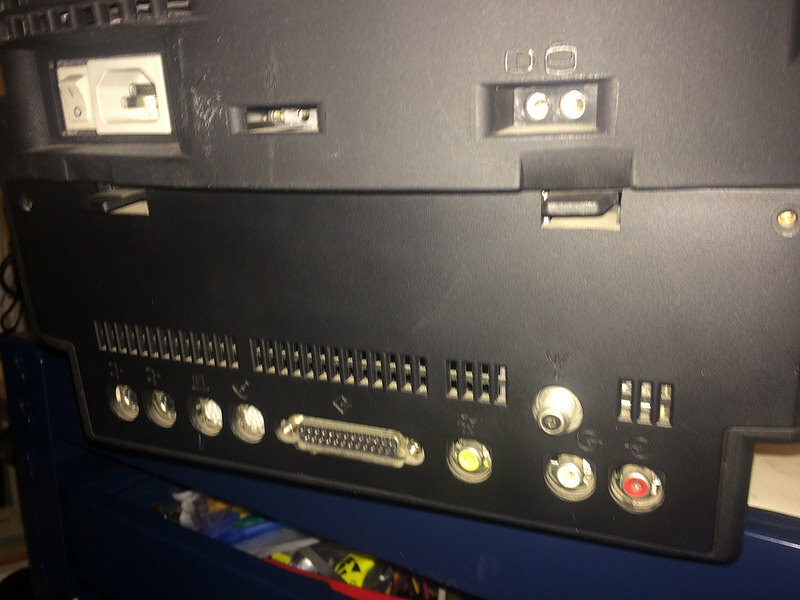 It’s a much better TV than a computer (the board is unusually limited, even for a Performa, and has almost no possible upgrades beyond what the computer already has), so it has been in storage for quite some time. 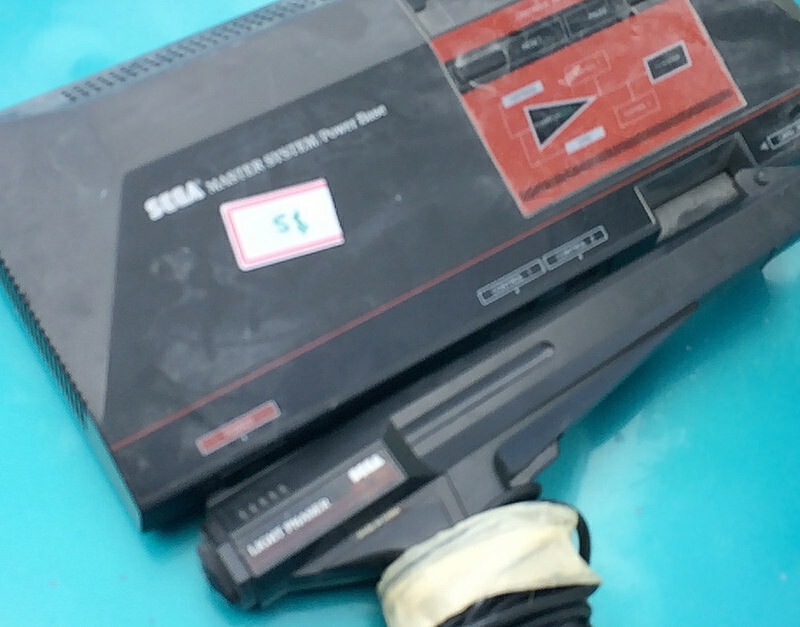 I finally got the chance to test the Master System with a Genesis controller. 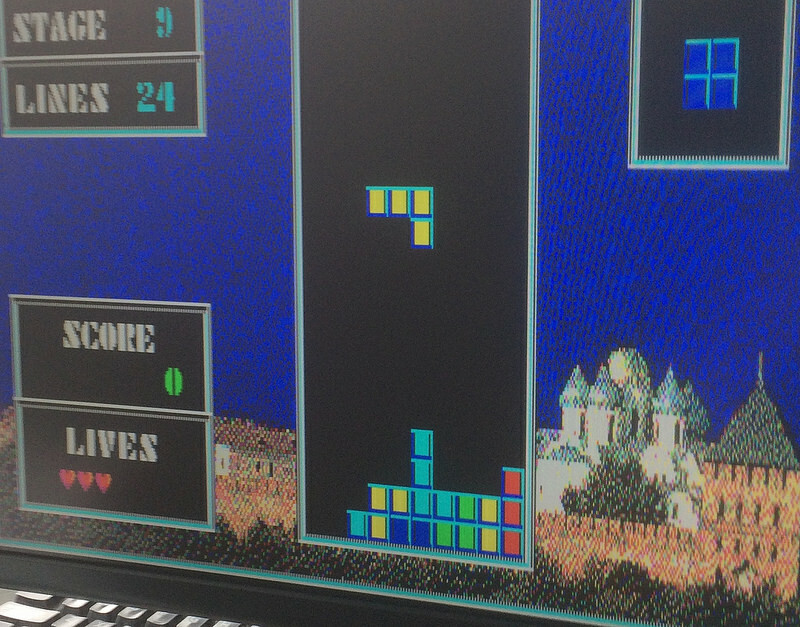 Early indications are that it worked great with the built-in games, as well as those in the cartridge slot. The choice of button mapping is a little weird (the “C” button accelerates in Hang-On, and of course there is no Start button). The replacement keys for my battered C64 arrived from Retroleum. It took a bit longer than I expected, but then again the postage was ridiculously cheap and it wasn’t like I was biting my nails waiting to play with the C64 I’ve had on the pile for a few weeks now. I’ll definitely be back to get more parts from them. Sometimes the best finds are in your own backyard. I was coming back from breakfast when I saw a garage sale sign. After following it for awhile, I took a wrong turn - and ended up at an even better garage sale, with no sign. 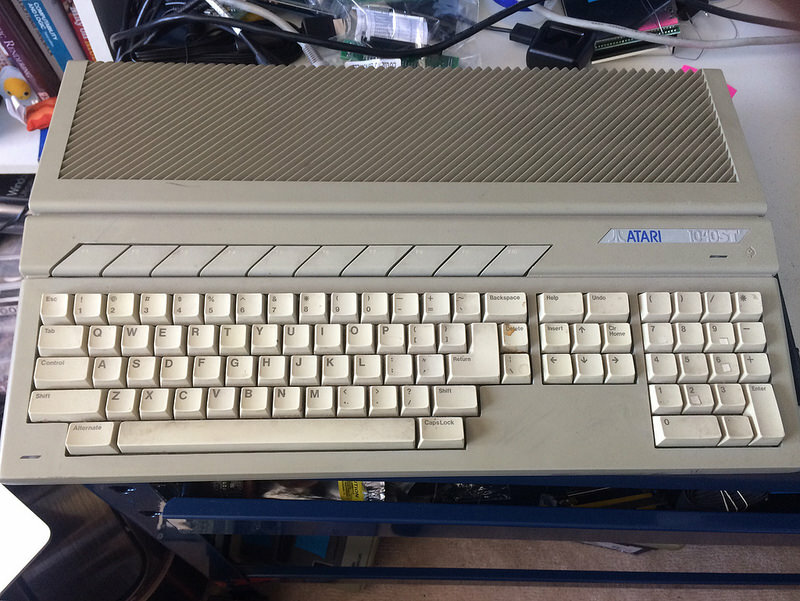 I’ve decided to start working on the “bad” Atari ST, with a non-functional keyboard and floppy drive, before I tear into the “good” 1040ST I just picked up. Today was a good step forward. 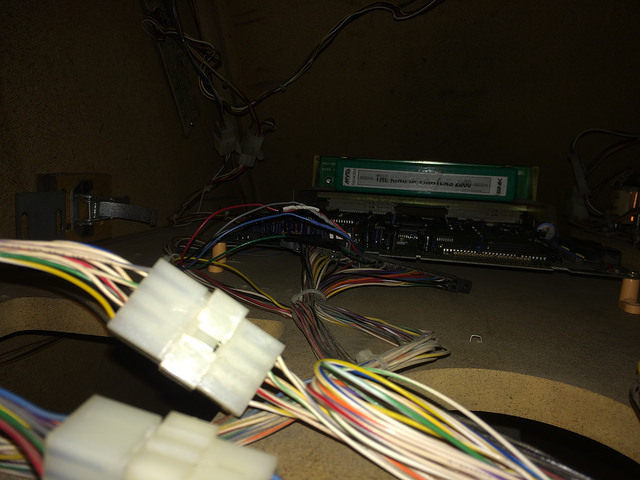 I finally got the case back onto the Amiga 2500, but there are still a lot of tasks left until the machine is really “ready” to be tucked away on my desk. 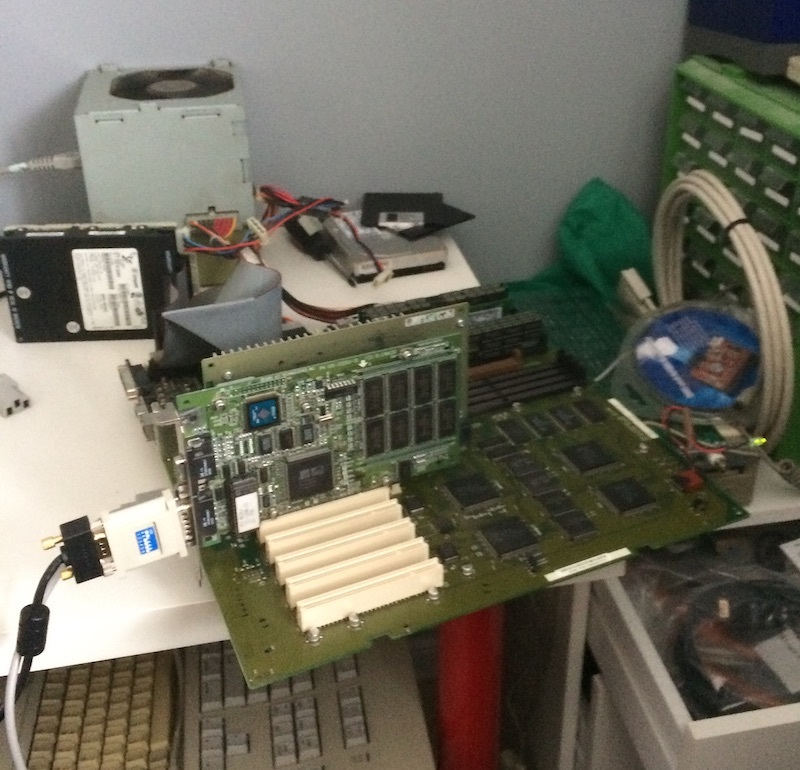 Now that work space is once again at a premium in my workshop, I find myself having to reassemble the diaspora of parts that were removed from my Amiga 2500 when it was dismantled to replace the 68000 socket. 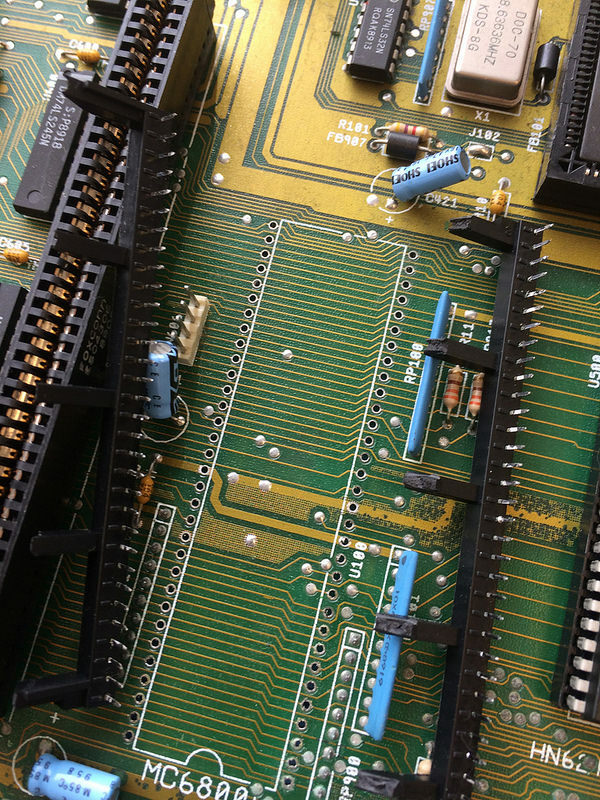 Many years ago, I got ahold of an Atari 1040STF for really cheap. However, I didn’t have any monitor to use it with, so it has sat in storage for quite some time. 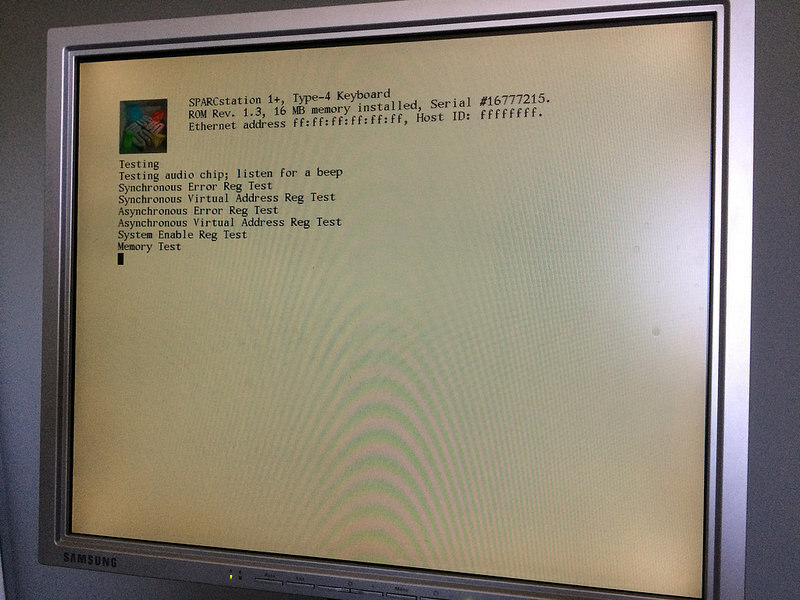 In a previous installment of the SparcStation 1+ saga, I got the machine to present a serial console to one of my other old computers, but couldn’t get any video out of the video card or boot to an actual operating system. 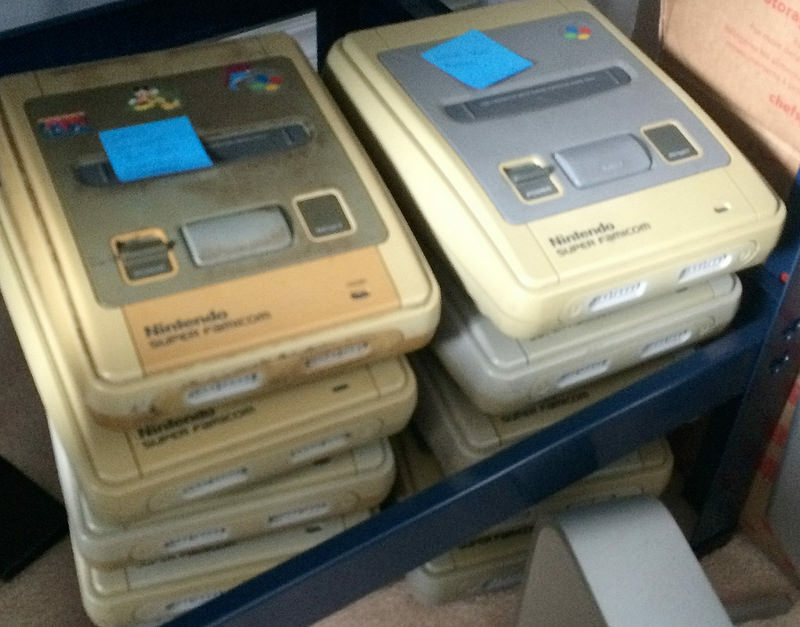 I bought a large lot of Super Famicoms off of Japanese auction for cheap, and set about trying to repair them. Almost all of them had problems. A power supply arrived from Ray Carlsen, and it works great. 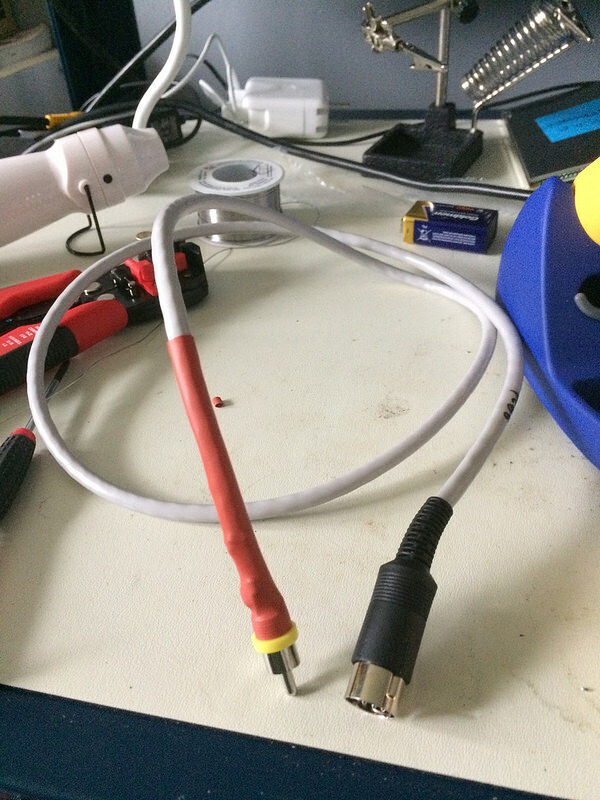 I spent the time while I was waiting by soldering a really bad video cable. I only managed to melt one DIN plug in the process! If all goes well, I will soon be the owner of an NEC PC-8801mkII “Model 30.” The platform is famous in Japan, as later models of the PC88 featured a ton of independent games, including many from developers who would go on to create games that were popular worldwide (Thexder, Snatcher and Ys all got their start on this platform). It also has a lot of trash, but neither of these things are interesting to me right now. I’d be happier just getting the computer to work (not least, because as a non-SR mkII, there are very few games I can enjoy on it anyway). 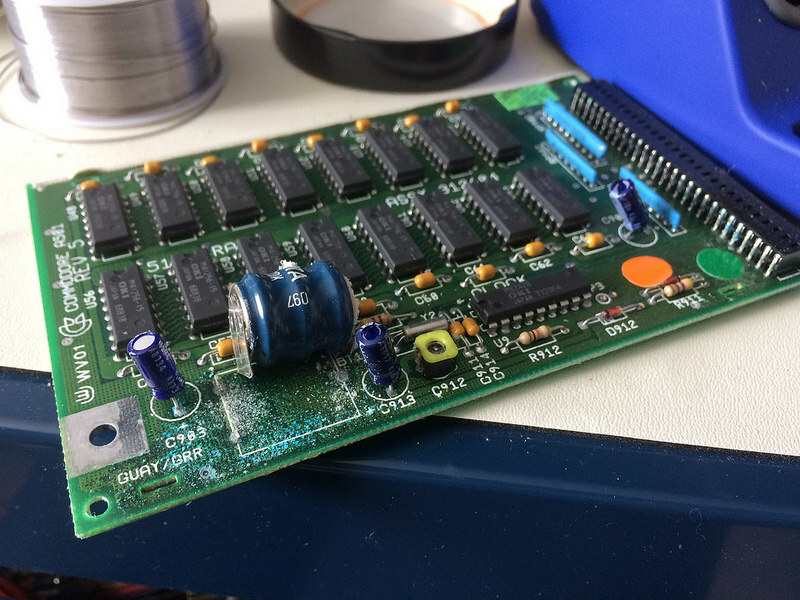 Things are starting to get hectic again with real life, but there was still some time recently to work on the Amiga 2500. My objective was simple: get the machine back together into a working box again so it is no longer spread all over my workbench. 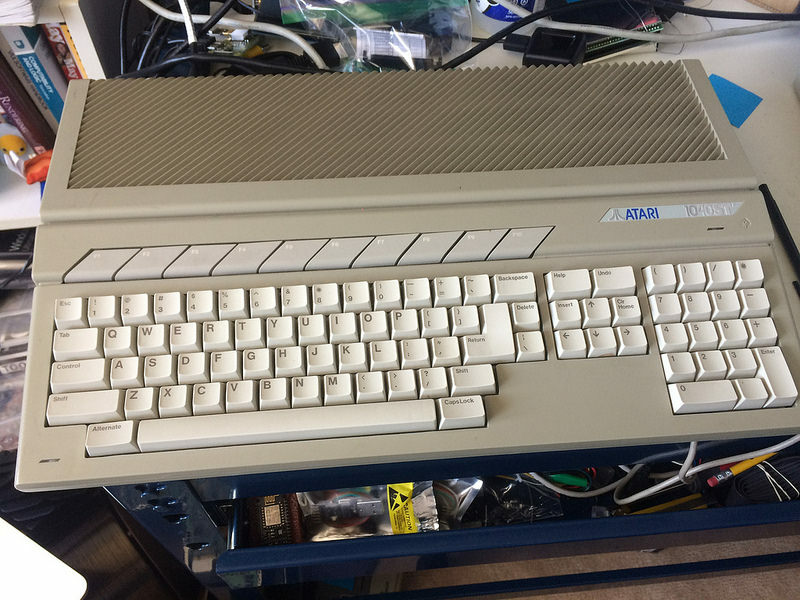 When I first got my Amiga 500, it wouldn’t boot. 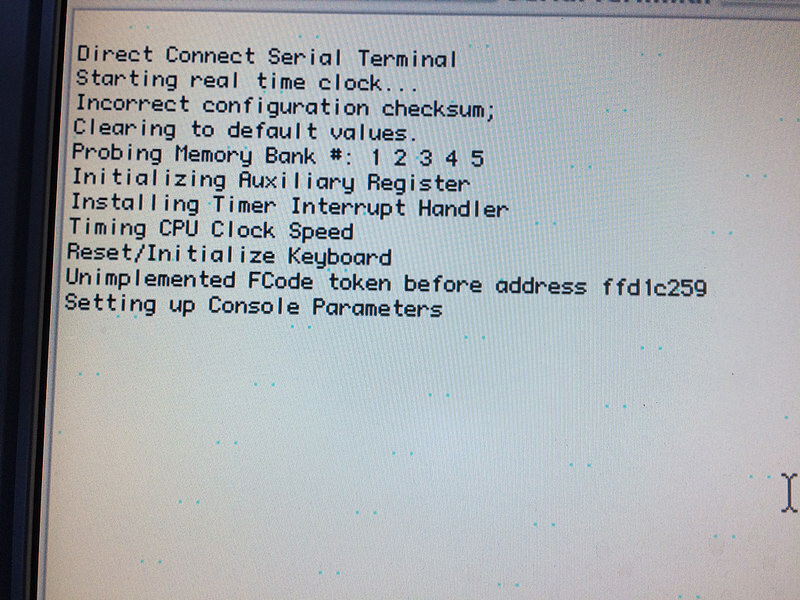 Suspecting something was wrong with the A501 512K memory expansion, I pulled the card, at which point it did boot. It didn’t take me long to realize that battery corrosion had killed it. 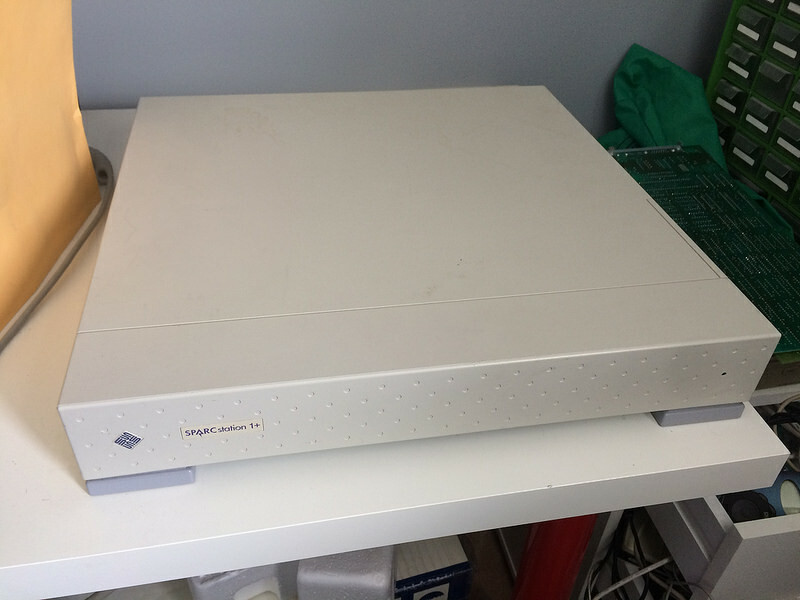 My streak of actually trying computers that are in my pile continues with this SparcStation 1+. While it has been a very loyal and very handsome monitor/keyboard stand for the last few years, it would probably be more interesting as a functioning computer. 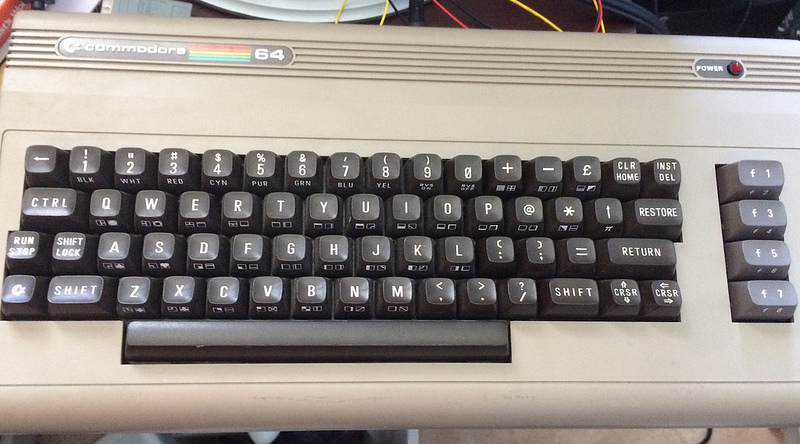 I picked up a Commodore 64 off the local classifieds. 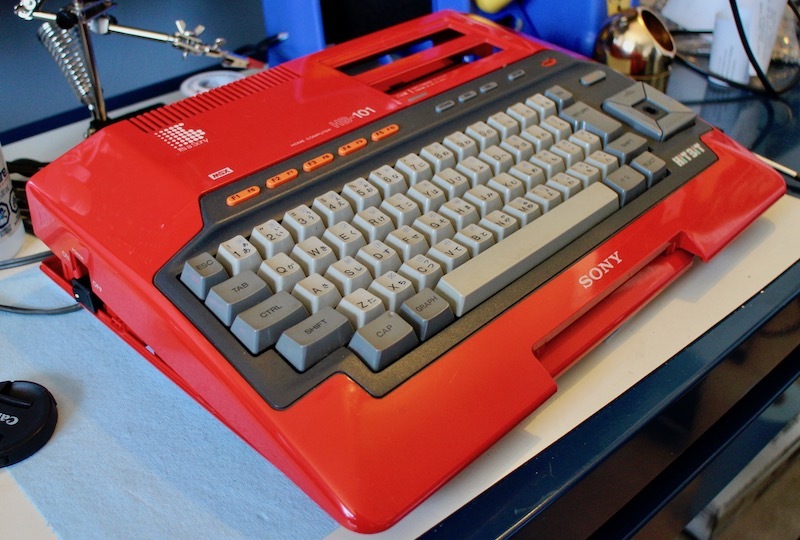 It came with a 1541 floppy drive, a bag full of blank floppies and tapes, the C64 itself, the infamous black finned power supplies that kill C64s, a Rixon modem, and a Nortel multi-line keyset from the 90s. 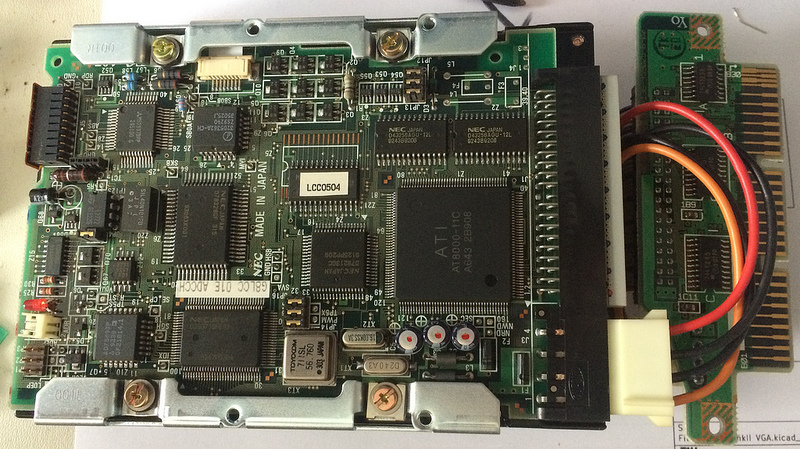 I recently flashed an eBay Gotek floppy emulator for use in my Amiga 2500 with the FlashFloppy firmware (based on the phenomenal work of HxC). I just got my A2500’s badly corroded CPU socket replaced with the help of my buddy and his employer’s substantial rework gear. I’ve had a Neo-Geo MVS cabinet in my house for about three years now. Ever since I’ve had it, it has complained of lost calendar data and generally acted up. For this entire time, I’ve ignored the fact that I have basically a ticking time bomb of battery acid in my machine. A Model 2 VA1.8 Sega Genesis purchased off eBay as non-working presented as non-working. After several days of diagnosis, tracing and research into the system, I finally figured out that the problem was the corroded trace I identified right off the bat. 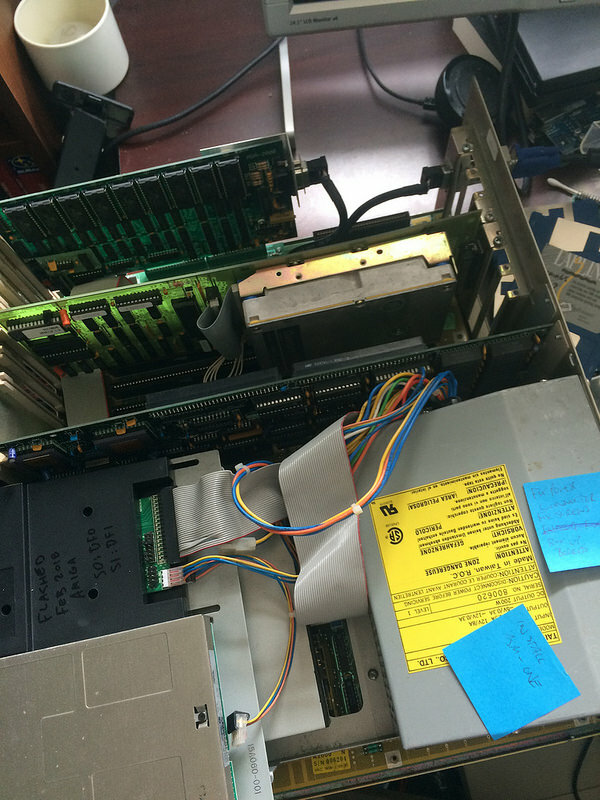 Many years ago, I ordered a surprisingly cheap Power Macintosh 9500/132 off eBay. When it arrived, the box was completely obliterated, with a hole in the middle that looked suspiciously like a forklift tine. Naturally, the Spindler plastics were nothing but dust. The seller sent me a replacement machine, and life went on, at least until I had to clean out that room and found the box of broken parts. 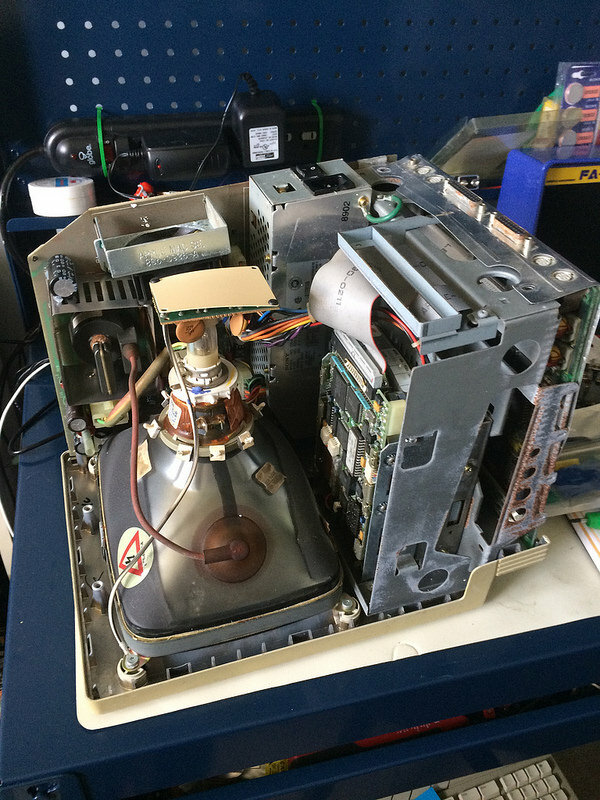 Threw a few more hours at the A2000 today, cleaning up here and there. 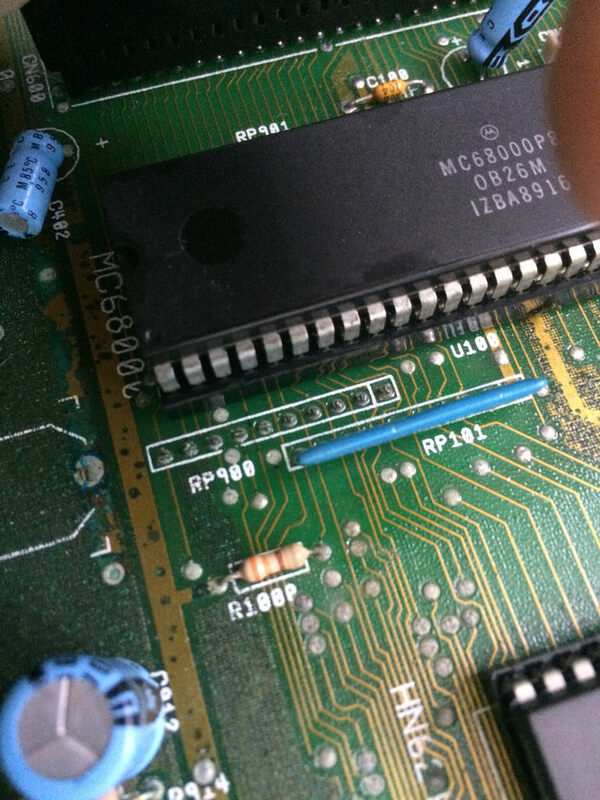 I popped out the 68000, cleaned up the pins, and checked the socket. The socket wipers are immaculate, not a speck of corrosion or acid on them (I checked with a magnifying glass). The pins for the socket on the underside of the board are still nice and shiny, so I’m willing to say the socket is alright. I’ve had this Amiga 2000 for several years, but it was only recently that I put in the effort to fix it. The big problem with these machines long-term is that the Varta clock batteries explode and corrode all the traces and sockets. Mine has a leaky battery for sure, so I hope I can save it. 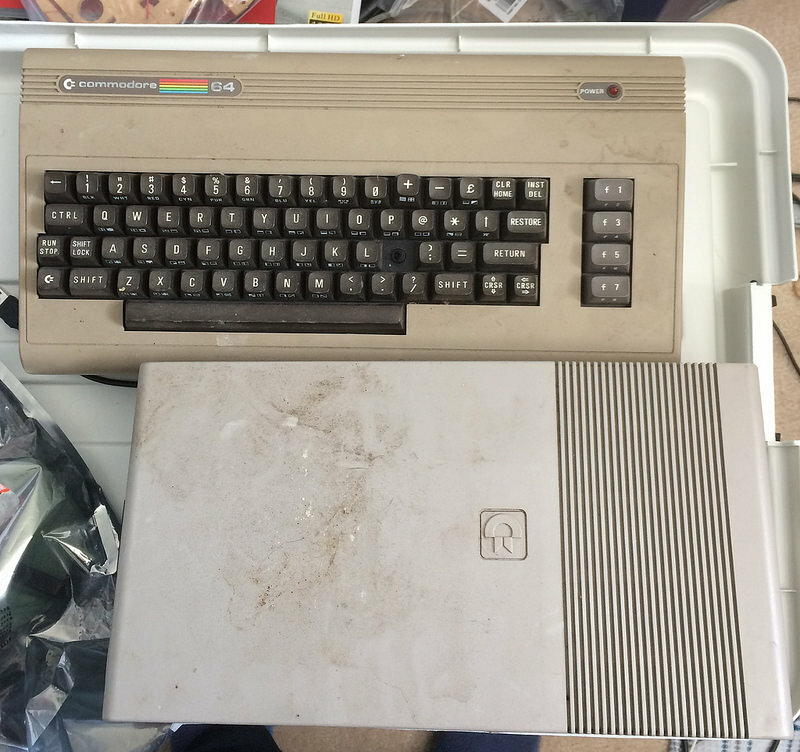 A couple years ago, I traded some car parts to a friend for his dad’s old Amiga A3000 and A2500. 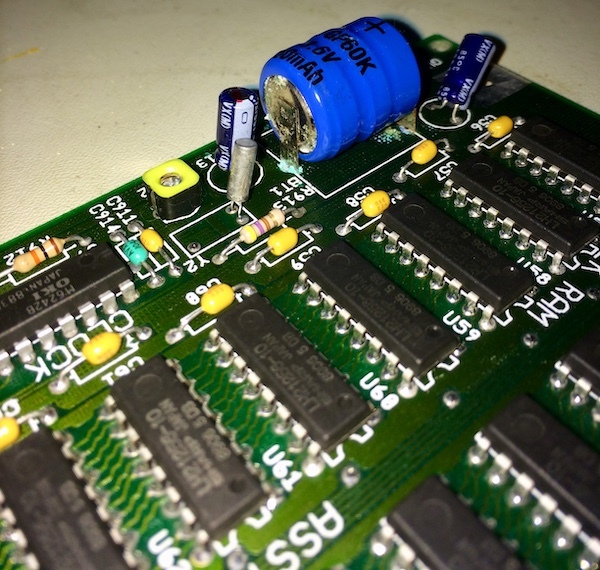 I knew that clock batteries were going to be a threat on both of those, so I nobly waited a year to take apart and desolder the battery from the A3000. That was back in 2014.